During our summer road trip across Central Europe, we decided to spend one night in Munich, Germany. Although, I wish we would have spent more time in the Bavarian capital, our one night was well spent, partially because of the hotel in which we stayed. Sofitel Munich Bayerpost Hotel is a bit more swanky than the hotels we typically book, but since we were staying on rewards, we decided to step up our hotel game and treat ourselves to a little luxury. 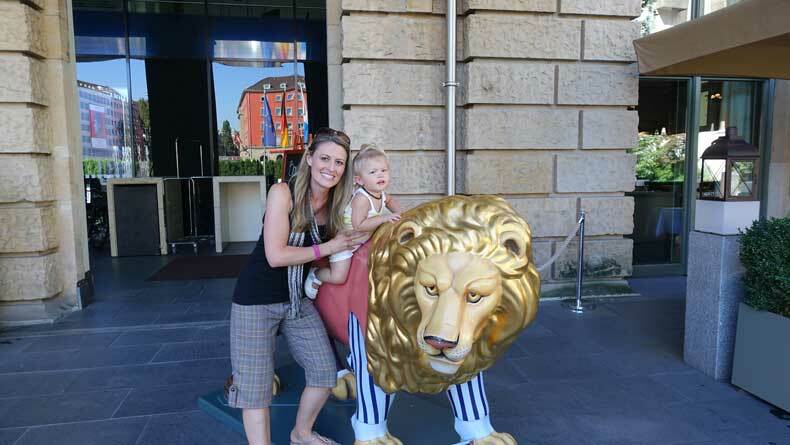 This luxury hotel in Munich was not only grand, it was family friendly! 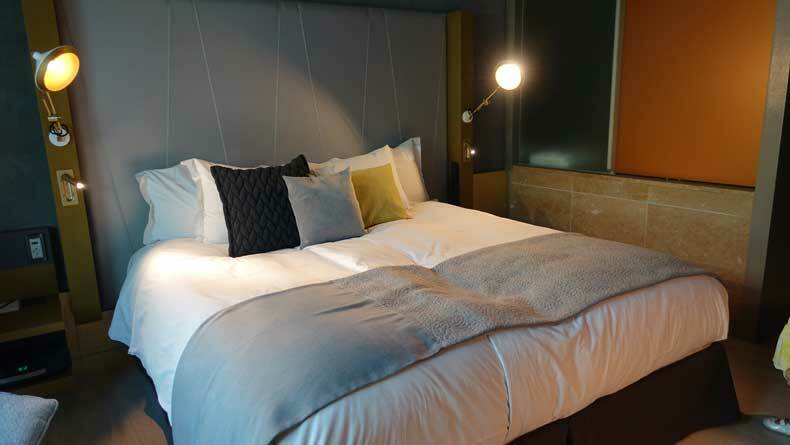 Sofitel Munich Bayerpost is a newly renovated, luxury hotel in an old historic post office in the heart of the city. 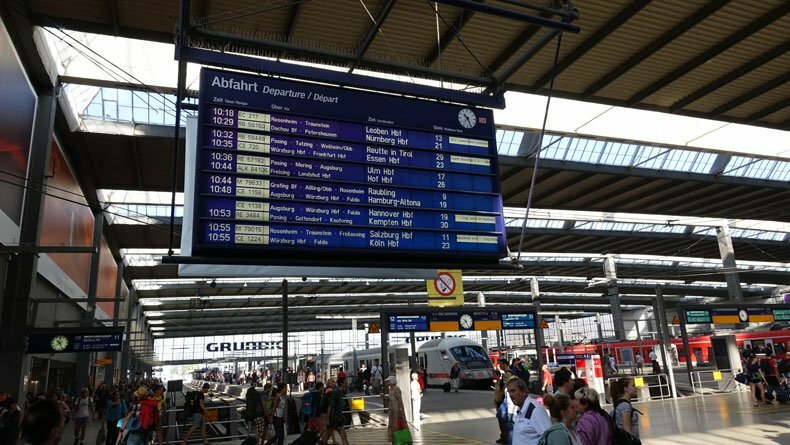 It is probably the closest hotel to the main train station in Munich. Literally, it’s practically in the parking lot of the train station. It’s about a 7 minute walk to Karlsplatz and a 15 minute walk through a busy pedestrian area to get to Marienplatz and the Viktualienmarkt. For those traveling by train, it is perfectly located, as you will not have to carry your luggage very far to get to the hotel. We were traveling by car which we found just as convenient. The hotel has an underground parking garage that costs approximately €30 per night. It’s a bit pricey, but the hotel is about as close as you can stay to the city center if you need parking. Sofitel Munich Bayerpost is one of my favorite hotels in which we stayed while in Europe, mainly for the family-friendly amenities. The hotel provided a crib with nice, comfortable children’s bedding. They also provided a child’s size bath robe, complimentary children’s slippers and a small stuffed bear that our daughter could keep. We couldn’t resist taking a family photo in our robes. 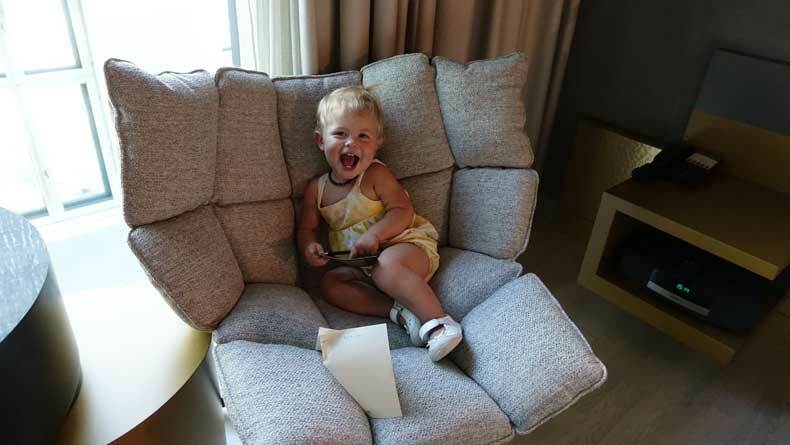 Other great amenities included a rocking chair and a mini fridge which was great for keeping our daughters milk chilled. There is a small market in the train station where you can easily buy milk or food products during your stay. The one thing our hotel room did not have that would have been nice is a bathtub. Instead, it had a walk-in shower stall. Pre-kids, this was definitely my preference, but with a toddler who takes a nightly bath, and doesn’t really like showers, a bathtub would have been nice. Sofitel Munich Bayerpost Hotel offers breakfast for an additional charge. However, to save money, we walked to the train station and grab an inexpensive breakfast there instead. For those traveling without children, there is an upscale bar and lounge on the ground floor. The rooms are nice, clean and modern. Sleep will come easily since the beds and linens are very comfortable. The rooms all have black out curtains, so even if you have to put a baby (or yourself) to bed while it’s still light outside, your room will be nice and dark. Wifi is free and the signal is strong in the rooms. There is also a desk in the room where you could easily set up a laptop. This would make a great hotel for digital nomads or business travelers, too. Overall, this is a great hotel for most types of travelers. They definitely go out of their way to make sure families have what they need. 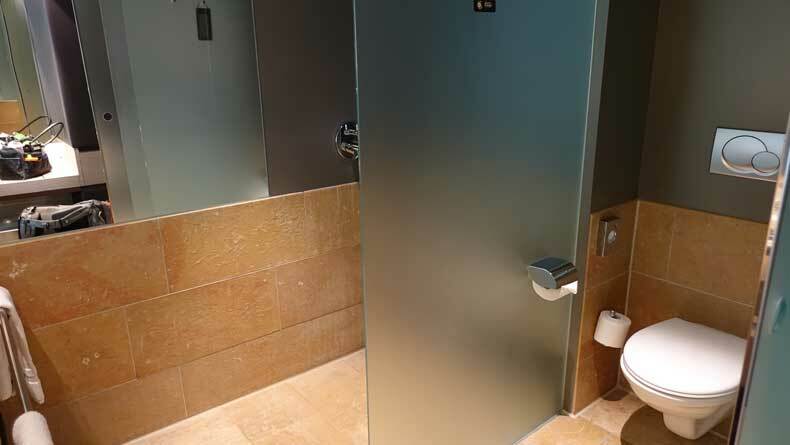 The proximity to the train station and the city center make this hotel very appealing, as well. 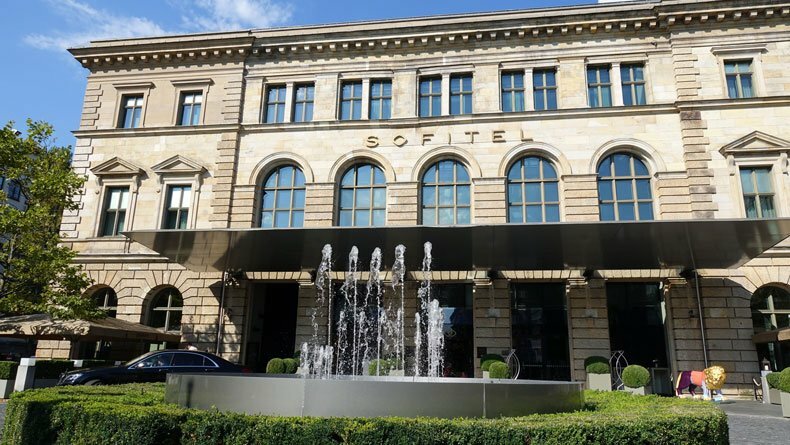 If you have a limited amount of time or just want to feel pampered, Sofitel Munich Bayerpost is the perfect, centrally located luxury hotel in Munich. Have you stayed at this luxury hotel in Munich? We’d love to hear about your experience. Leave your thoughts in the comments below. Loved the pictures. And the hotel room was beautiful. Thank you! They won me over with the toddler robe and little teddy bear. It’s funny how little things like that make a big difference to me now. It just shows they care about families traveling with kids. I was going to ask if that building was built as a hotel, but I see it’s a historic post office. I love staying in historic buildings. It looks like a fabulous hotel in a great area! It does look swanky! I love the crib with bedroom slippers for kids. So cute! The location is also perfect! As much as I understand the necessity of sponsored posts, it’s really refreshing to read a hotel review that was purely motivated by a great stay! Great point about proximity to the train station. I know a guy who books accommodations purely on the basis of how far he has to walk from the station! Most of the trips we’ve taken to Europe were backpacking trips and we took the rail. So I can totally relate to looking for places close to the train station! I hate lugging all my things on my back if I have a long walk to the hotel. 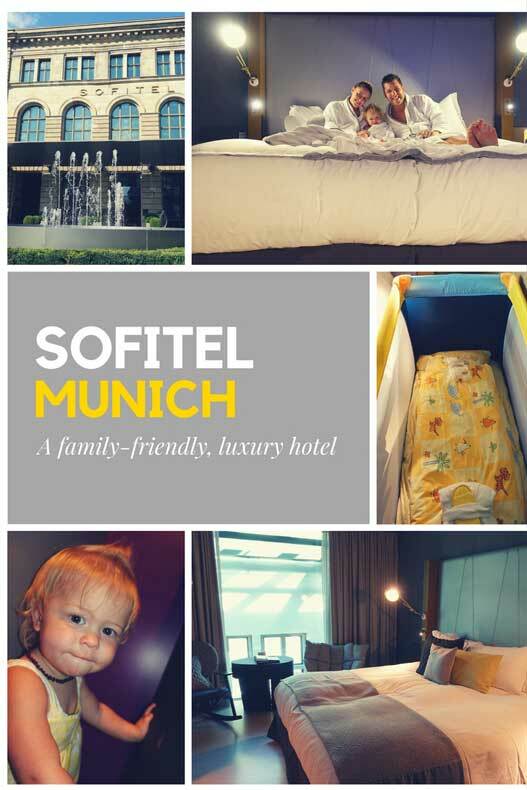 Sofitel Munich looks like such a great place to stay. And the fact that they gave robes for your daughter too, who is totally adorable, is actually a great thing. Will definitely keep this hotel in mind. Thanks! We love our little traveler. And as a mom, I absolutely love it when we find hotels that don’t treat children like a nuisance. Little bit of luxury is always good! 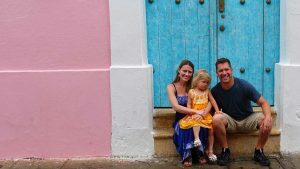 It’s great how family friendly they are, many hotels forget about family travelers, unfortunately. You guys look so cute tucked in the bed! Haha! Thank you! And I agree, a little luxury every once in awhile is good for the soul. Wow, talk about luxury! That’s so cool they have all the children’s amenities. You have to live it up every now and then. It’s especially nice being so close to the train station. Thank you! Traveling is in her blood. I hope she grows up loving it as much as we do.